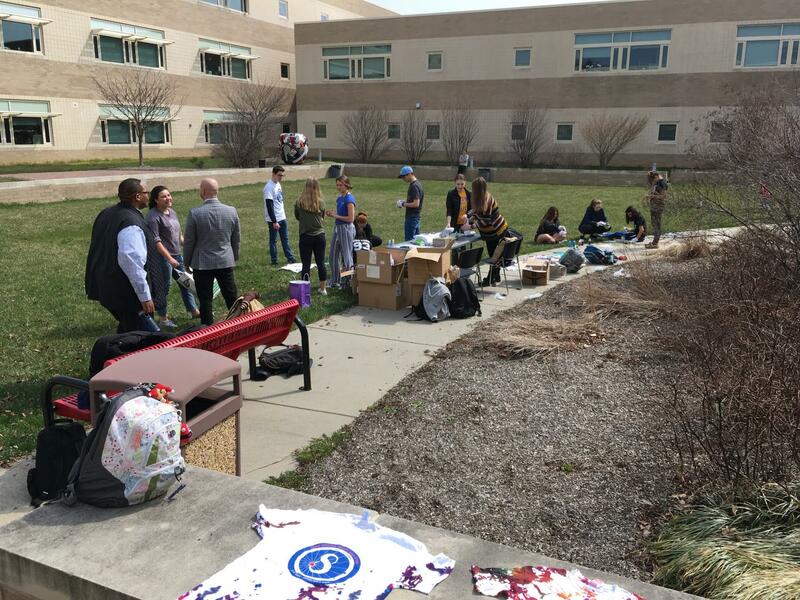 Harriton students tie-dye Adam Spector Walk T-shirts in the courtyard, April 12, 2018. After spending four years at Harriton, one phrase I’ve heard often (and occasionally believed) is that we don’t have school spirit. After all, few go to the football games, there isn’t a big homecoming dance, pep rallies are at times simple and lack energy, and, of course, the student body is overwhelmingly college-bound, self-absorbed, and un-athletic. If this rings true in your mind, chances are you’ve also felt that Harriton has no spirit. In my junior year, I watched a video (a senior project, in fact), made by Ricky Sayer, who now is studying at Syracuse University. I will note that Ricky is probably one of the most spirited students to ever attend Harriton High School. Everywhere he went, people knew his name and engaged with him on his interests. People could really rally around a guy like Ricky. Just think what a community would be like if everyone treated everyone else in this same way. Ricky contended that Harriton actually did have school spirit, but that it was manifested in more nuanced ways; we support our academics like Science Olympiad, we might befriend our teachers as much as our peers, and we take pride in the things that make us unique individuals. People are kind here at Harriton, he contended, which shows more than anything our sense of community. I think that this is exactly right, but only scratches at the surface of the matter, and does not explain the reasoning behind it all. What is the basis of school spirit? Interviewing applicants for Student Council last year, it was at times tiring to hear this over and over. What’s the commonality? Look back at that list of suggestions and consider who is responsible for making these changes. Administration and Student Council, predominantly, right? Who else has the authority to do these things? After all, we can’t possibly have school spirit until we all go to the LM game, and we can’t do that until the rest of the school is going and the rest of the school won’t go until there’s a major change at the top—a trickle down school spirit. To say that school spirit trickles down from the top is to mislead yourself into thinking that school spirit is someone else’s job. The only thing worse for spirit is the act of saying “we don’t have spirit.” That’s because pride in our school, although it is aided by strong support from the top, is built by each and every student. So why do so many people complain about the lack of spirit and then refuse to join in on these activities? Why do people complain about the Ram Report? Why do so many people avoid my shameless pleas to get them into a meeting of the Art Club? It’s because we don’t view spirit as our responsibility. We still view it as the school’s responsibility. I once saw a TED Talk that explained an important concept through the lens of a dancing “lone nut” at a music festival who “starts a movement” of other ridiculous dancers (It’s only three minutes and can be found here). The role of the leader can be important, but the success of the movement is the willingness of the followers to join in. In the rare moments when everyone agrees that Harriton has spirit, it’s more popular to join in than to not join in (think of Mr. Harriton, which sells out every year). We would be able to recognize that we have spirit if we could recognize all the elements already exist and that it’s important to just jump in, even when it might not be a successful movement. Our sense of school spirit should not be measured solely in terms of football games. It should be measured in the terms identified by Mr. Sayer – the celebration of what makes us unique. These include the opportunities that the school presents, the relationship we have to teachers, and the success of our academic institutions. Consider for a moment that these are the “lone nut” movements. This is the foundation for school spirit; the bases that we already have covered. We don’t need administration to create more pep rallies; we need more people to participate when it comes to all these already-existing elements. What if we all jumped on board, not necessarily caring about the long-term success of the movement, but rather with the fun we’ll have in the moment? If individuals are responsible for our school spirit, we will feel more spirited because we will be more spirited. It doesn’t start with everyone miraculously going to the LM game. That’s too big a jump. Let’s start small. I can think of one student at Harriton who exemplifies spirit beyond any doubt. Every time I see him, he raises his hand to give me a high five. Seemingly ridiculous at first, but it’s important to view this in terms of the start of a movement. If more students were brave enough to do something on this scale on a daily basis, even smile at every student in the halls, the effects would be positively tangible. I’ll end with one of my favorite quotes, which comes from Mahatma Gandhi: “Be the change you want to see in the world.” If you believe that your school lacks school spirit, you can make change. You can take responsibility for your spirit and jump on board when something fun isn’t yet popular. Don’t wait to follow when everyone else has already jumped on board; challenge yourself to be the change you want to see in Harriton.